Disclaimer: This review is from a reviewer’s copy of the game that was provided by North Star Games to Open Seat Gaming, but opinions are our own based on several plays of the game. Description: Dude is a game where you say "dude". That's literally what it is. Okay, there's a bit more to it than that. Each player has a shuffled deck of cards with different ways to say "dude" and the goal is to get your cards out of your deck and onto the table first. To do that, you emulate the way the card wants you to say "dude" (such as long and drawn out, or quietly, or psychedelically, etc.) and if someone else is saying it the same way you both say "sweet," reveal your cards, and if they match then you both get to put them on the table. If they don't match, flip them to the bottom of your deck and try again. You can also pass on a card if it seems like nobody has the matching one by flipping it to the bottom and looking at the next one. Once someone has all their cards on the table the game is over and they win! More dude is the stand-alone expansion that plays identically. 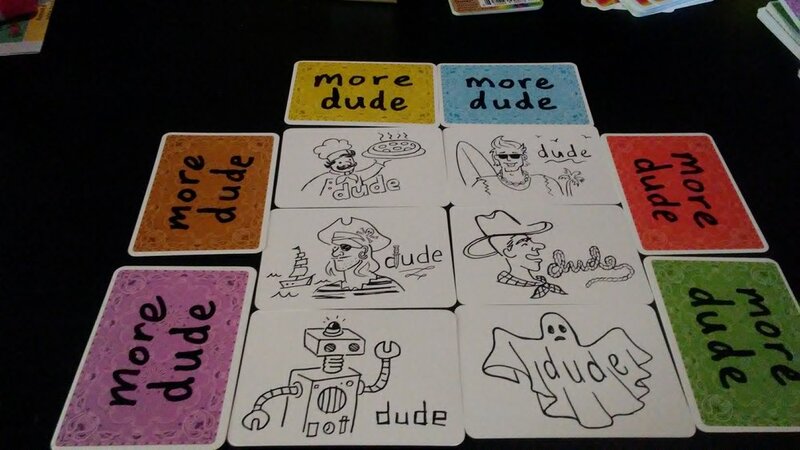 It introduces new ways to say "dude" that can either be used by themselves or mixed with the decks from dude to make a longer and more involved game. More dude has you saying "dude" like a cowboy, robot, and other fun, new ways. More dude can also be mixed together with Dude to create a more varied experience. Review: There is only one word to describe this game - dude. Okay, and maybe "ridiculous." Because when you've got a bunch of goofy adults standing around and saying "dude" to each other in some of the goofiest ways possible. Who is the dude on the box? Is it the dude from the Big Lebowski? We got to try the concept out at Unpub after-hours about a year ago, and when it came out for general release, we knew that we needed to get it for ourselves. This game is unique, fun, and a great ice-breaker if there ever was one. It definitely deserves its place alongside of Happy Salmon and Funky Chicken. The design on the cards is fantastic. I believe that they make it quite obvious what it is that you're supposed to say. And, it feels different with every group you play with, because everyone interprets the cards differently! The art on the card backs harkens to the Dude's rug, which ties it all together, in the movie The Big Lebowski. The art on the more dude cards is really fun - the word "dude" is accompanied by goofy art, as you can see below. It is a strategic game? Nope, not one bit. Is it a heck of a lot of fun? Absolutely. And it has a home in our Quiver as a result. Try, Buy, Deny: Do you like party games? Do you enjoy laughing, a lot? Did you like Happy Salmon except the whole "getting up and moving around" part? Then dude is a buy, hands down. If that doesn't describe you, it's at least a try. I believe everyone should at least try dude or more dude at least once, and then pick it up at your local Target or from North Star Games if you enjoy it.